I want to buy 3d printer so I would like to know which you would recommend. I need one because I started to model the Death Crown ( it isn't yet far and it won't look as good as the masks of you but I try). It looks crazy good in person, I just got mine today, in red. I'll try to get some pictures of it in case @LoganMcOwen only has white. Did you also get it? 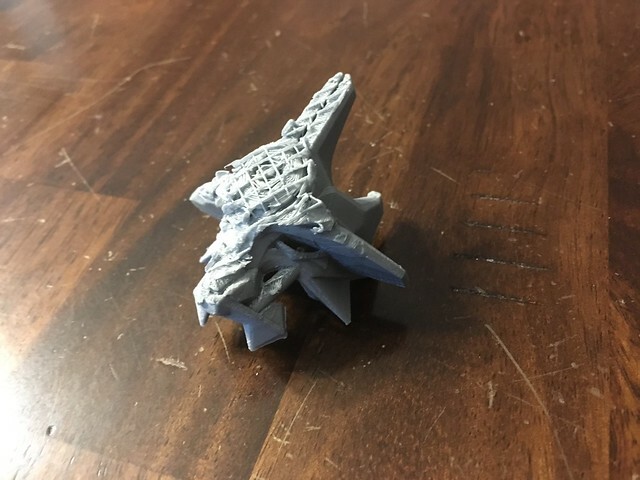 I printed it face down, which was a mistake that I should have never done. What you see on the front is the support structure that was printed during the printing process. @Cyber-Hand how would you print this mask on your personal 3D printer? i printed mine vertically. just get something to use as a chisel and a file, and you'd be set. Well, on the bright side you now own the exclusive mask of ultimate waffles. Have you ever thought of making a Flickr account? Flickr is a photo sharing website where many people post things such as their lego creations and their setups. Can't say I have. I should really try and be more active with posting things I have been working on though. I would agree with bio toa, his does have a nice setup for the cost, and you learn a lot about the machine by putting it together yourself. You will need to make a case for it if you are in a colder climate though. If you can wait a few more months, the ONO printer I mentioned before will be out for less than $200 and perfect for printing lego parts. Think the proto MoF came out looking well, suprised nobody has showed it on Tahu yet.. Thanks I am very pleased with how it turned out, very few people have bought it so far so I think that is the reason why there are no photos. Please do. I will put them up on shape ways so people can see it. Ah haha, thanks for posting this photo I had a good laugh when I saw it. 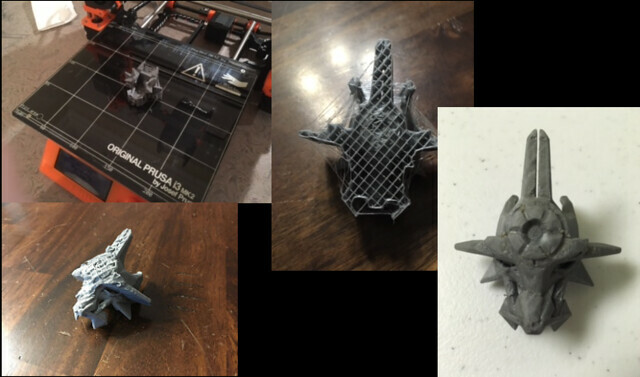 I printed it face up with the back of the crown and mask clip touching the build plate. Takes a little more support but the way the back looks is not as important as the front. I found that the top two prongs are weaker when printed this way. Coming soon, the mask of ultimate waffles. Used by the Toa of Maple syrup to make food so delicious his opponents are incapacitated by the desire to eat it. If you can wait a few more months, the ONO printer I mentioned before will be out for less than $200 and perfect for printing lego parts. From what I can find online, the ONO 3D printer is supposed to start being up for ordering around November, for about $130. I want to see more pics of the the print quality for the ONO. Right now I'm hesistant on investing in it because of the need to buy their exclusive resins and the need to replace special screen filters/printing films. Plus, I also want to to get into printing some action figures and I feel the print size of the tank would be too small for my needs. 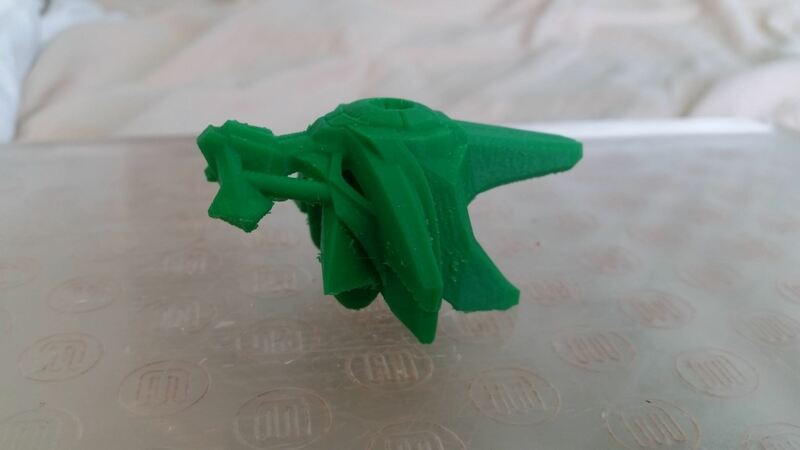 From what I can find, the resolution of the print is determined by the resolution of the phone but it has some troubles when trying to print at a 50 micron layer height, I believe. Meet ONO, the smartphone-powered 3D printer that costs just $99. This photopolymer DLP printer works with the visible light from your smartphone and could open up the world of 3D printing to the masses. Hopefully I was able to answer the question you have asked in the way you have wanted it. They said they will be putting them up for sale after all the kickstarters get theirs, which should be later this month. Do it. Make the mask of ultimate waffles. When i get mine i will take photos and post the results here. from what I can tell the resin price is $15 per 100ml which works out to about $2-3 per bionicle mask. You should be able to design your action figures to click together and that way it will fit. I found the info about the ONO printer going to be available to be bought in November from one of the videos posted above. November was an estimated date for last year. All the videos you posted were from October 2016. This is the direction I printed mine. well thanks for sharing that with me, I actually debated printing printing it like that but decided to not due to I was using PLA and it would be hard to get the supports off. Needle nose jewlery pliers, and a dremmel. They are my printers best friends.